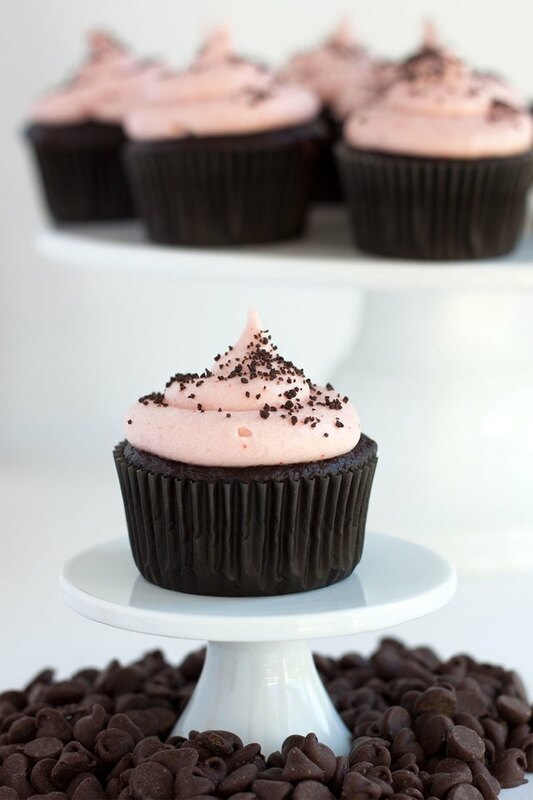 The moist dark chocolate cake and fresh strawberry buttercream in this cupcake recipe is such a winning combination, you’ll want to eat a hundred of these. 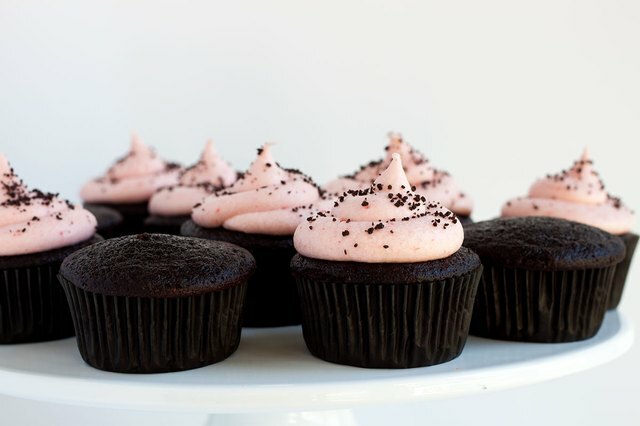 Plus, how pretty is the naturally dyed pink frosting? 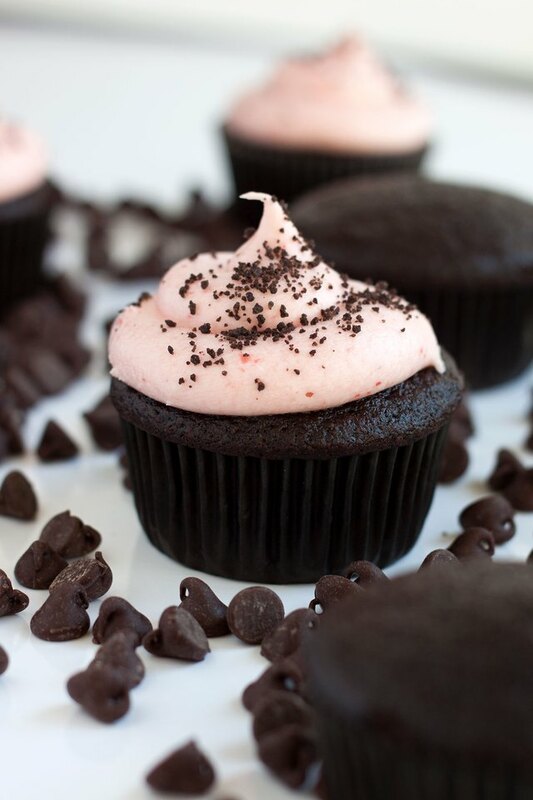 Bake a batch for a baby shower, Valentine’s Day or a regular old Monday. Preheat oven to 350 degrees Fahrenhiet. Line a cupcake tin with baking cups. Combine sugar, flour, cocoa powder, baking powder, baking soda, salt and espresso powder in a large bowl. Beat in eggs one at a time. Add melted butter, milk and vanilla and stir until batter is smooth. Fold in boiling water. The batter will be thin. 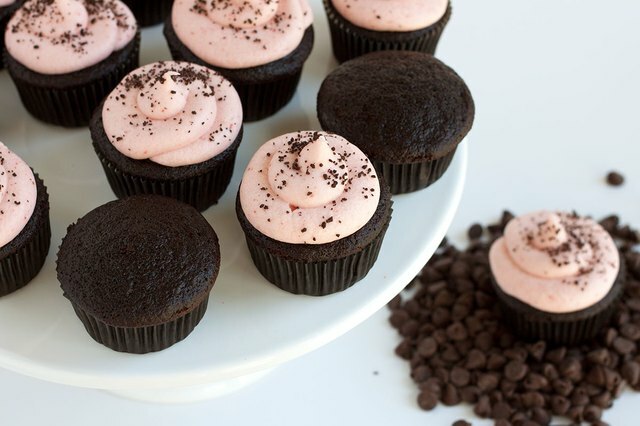 Fill cupcake tins ¾ full. Bake 17 to 22 minutes or until inserted toothpick comes out clean. Let cool completely before frosting. While the cupcakes cool, prepare the frosting. In the bowl or a stand mixer, blend cream, butter and sugar. Add vanilla, salt and strawberry puree and mix until smooth. Keep the frosting refrigerated until the cupcakes are cool. Frost cupcakes. Serve and enjoy! Garnish your cupcakes with chocolate cookie crumbles, sprinkles, shavings or chips!